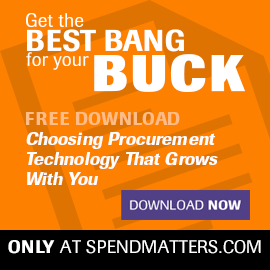 Spend Matters is the world’s number one information source for procurement and supply chain professionals across industries - enabling procurement executives, consultants and technology solution providers to make smart decisions regarding all things procurement. Our audience, diverse and mostly at the CPO, VP, Director, and executive levels, are procurement, finance and supply chain professionals from organizations large and small, Fortune 500 to small start-ups. Solution providers and consultants can engage with Spend Matters readers in several ways through services designed to engage a procurement-dominated audience, including impression-based digital advertising. Download the Spend Matters Media Kit or access the Editorial Calendar to learn about audience/traffic and available opportunities. Spend Matters is operated by Azul Partners, a digital B2B media, publishing and advisory company with 12 procurement, supply chain and commodities-focused research and advisory ventures, including publications Spend Matters and MetalMiner. Learn more about Azul and the wide variety of advertising and demand generation programs available. Contact Spend Matters to discuss engagement opportunities.